Naturally rich in Lactobacillus, Acidophilus and Enzymes, Probiotics are live bacteria and yeasts that are good for your health, especially your digestive system. 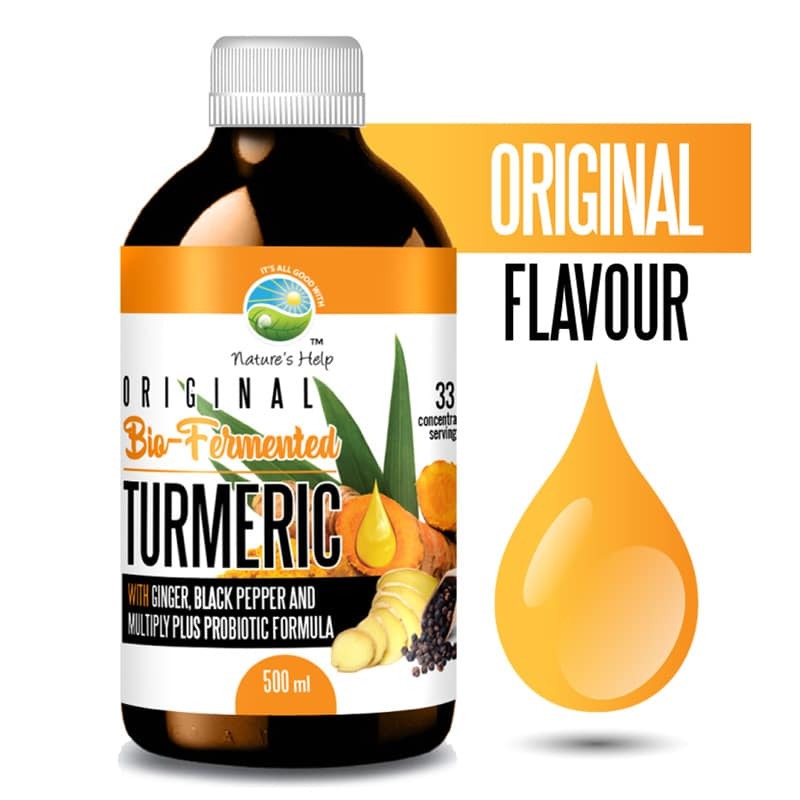 Bio-Fermented Turmeric with Ginger, Black Pepper, Multiply PLUS Probiotic Formula and Papaya Fruit and Leaf Extract. Inflammation and poor gut health are two of the leading causes of disease today. You probably already know that certain types of bacteria live inside your body – good and bad. The good bacteria help in the processes of fighting off infections and keeping your organs healthy. These types of “good” bacteria are called probiotics. Ready to reap the benefits of Bio-Fermented Turmeric and Probiotics? Are you ready to restore digestive balance and maintain intestinal health? Do you need help with relieving symptoms of bloating, gas and flatulence or simply support a normal healthy immune system, then look no further. Nature’s Help has three delicious bio-fermented turmeric liquid formulas to try: Original, Wild Berry and Tropical. So there’s no excuse to not get your daily dose of turmeric and probiotics all in one. What this means to you is you get the benefits of probiotics and turmeric combined in a delicious-tasting formula. Naturally rich in Lactobacillus, Acidophilus and Enzymes, Probiotics are live bacteria and yeasts that are good for your health, especially your digestive system. We usually think of bacteria as something that causes disease. But your body is full of bacteria, both good and bad. Probiotics are often called “good” or “helpful” bacteria because they help keep your gut healthy. This product also includes bio-fermented papaya leaf and fruit extract which supports a healthy digestive system. Bio-fermented papaya fruit and leaf extract is one of the strongest and most concentrated immune boosting foods available. The above ingredients are processed in a probiotic fermentation plant that ultimately changes the structure of the ingredients that create a complex mix of highly available bio-active compounds. Made from 100% natural ingredients, without the use of herbicides, pesticides or chemical fertilisers. No artificial preservatives, colourings, stabilisers or food acids added.